I've wanted to write for ages, but I've been having a major crisis of confidence with my blog (I must be having a midlife crisis at 31!!). I took some holiday, and took stock of the situation...I write because it's an outlet for my love of fashion, so if I stopped writing I suppose I'd have nowhere for my creativity to roam free. So if you're reading this thank you, if I can at least make one person somewhere smile, then I know I'm doing a good job in sharing my true passion with you! So with that said (rant over! ), I'm going to chat today about a little trip I recently made to Cheshire Oaks; just in case any of you feel like visiting and want an honest opinion from a fellow shopaholic! Cheshire Oaks Designer Outlet is part of the McArthur Glen group and is situated at Ellesmere Port in Cheshire, just a forty-five minute drive away from Manchester and thirty minutes outside of Liverpool. 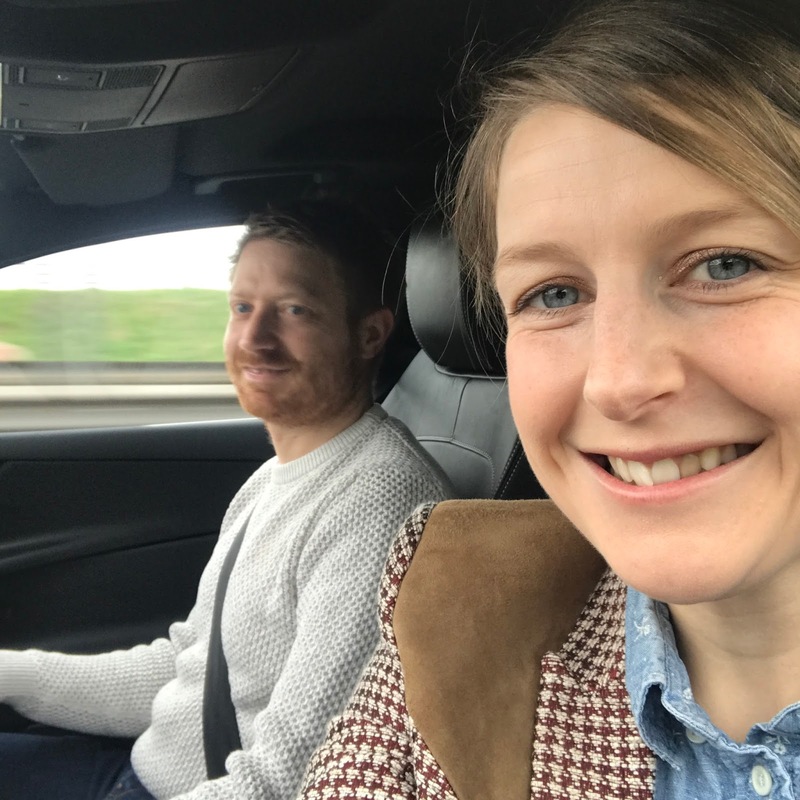 I live just outside of Durham, and my Mister and I often visit York Designer Outlet in search of designer bargains (the jacket and the shirt in the photo above both came from YDO, the jacket was an £80 bargain from The Kooples and the shirt is from Levi's), but as we were visiting his sister in Huddersfield, we decided to brave the M62 and take the long drive in search of Burberry, Belstaff, Mulberry and some of the other brands that aren't available at the York site. Pulling into Cheshire Oaks, the first thing to note is that it's absolutely enormous. The Ralph Lauren alone is bigger than most homes, and although Google suggests that you can navigate your way around the complex in a mere two and a half hours, I beg to differ. Although we are seasoned pros when it comes to shopping, it took us more like six hours-when in Rome...(or in this case when in Cheshire Oaks) do as the shoppers do and make a day of it! There's ample parking throughout the site, so even though we visited during the school Easter holidays, we had no problem finding a parking space. As a rule of thumb, if you're visiting for a more high-end shopping experience, I'd suggest starting with the shops behind Ralph Lauren, as it's here you'll find Burberry, Belstaff, Mulberry, The Kooples etc. The main player on my hit list was Burberry. I love Burberry, and was hoping to bag myself some new accessories. There's no photography allowed in store, but I loved this visual merchandising set up just outside. The staff in Burberry were great (I always find this no matter which Burberry I visit!) and although I didn't find anything that I loved enough in order to part with my cash, the prices were great. I tried on a short, navy Burberry rain mac, but the length wasn't very flattering. A lovely sales assistant told me lots about the coat and helped and humoured me as I tried on various styles and sizes, she couldn't have been more helpful and the experience was in no way intimidating. 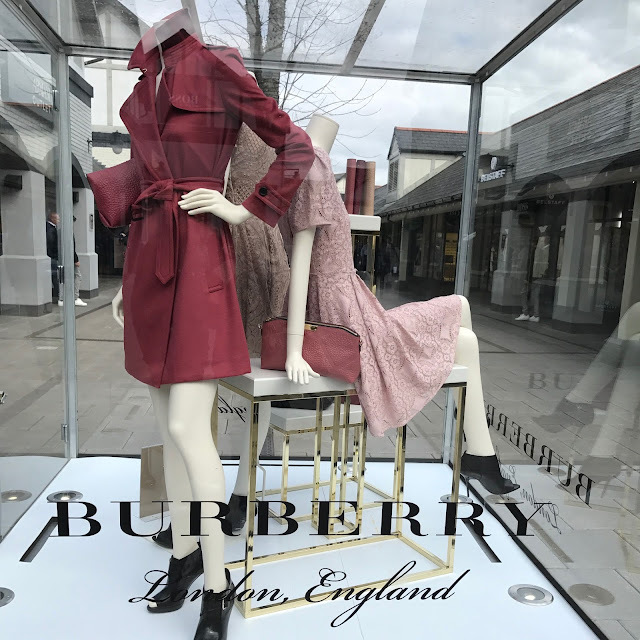 A lot of the stock in the Burberry outlet is seasonal, so if you're expecting a half price heritage trench you won't find this here, but there's still a lot of choice; it definitely gets the thumbs up! I worked my way through lots of the high-end shops. Many of the stores were running offers, so there were some amazing prices. The Kooples were offering an extra 20% when you bought two items, and Coach were offering a further 10% on purses just to give you an idea of some of the offers you might get should you visit. It's a great way to live a champagne lifestyle on a lemonade budget that's for sure. ...say hello to my new Ralph Lauren purse. 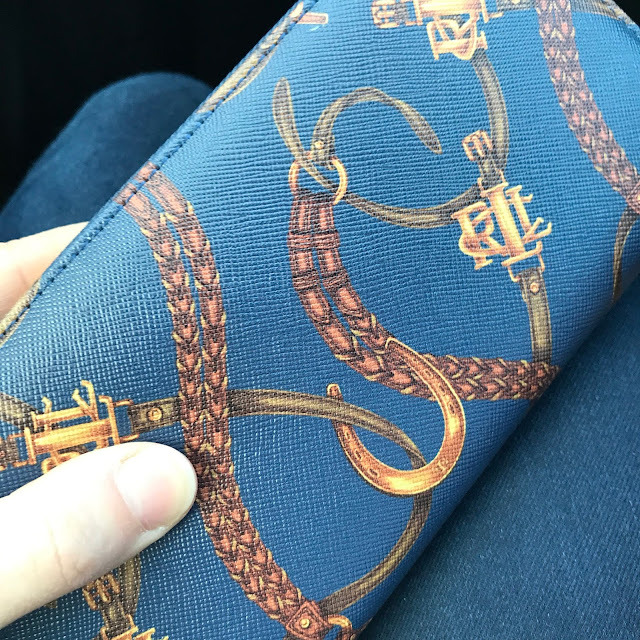 Ralph Lauren is really impressive at Cheshire Oaks and there were lots of lovely things that I could've easily spent money on-but I needed a new purse and fell in love with this one. £89.99 reduced to £39.99 and with more money off at the till, I ended up paying £30.39 for it! Bargain! Isn't it pretty?! I also picked up these cute little earrings for £6 from Monsoon and some things from the Bodyshop. We spent the whole day shopping, and whilst there are plenty of great restaurants and cafés such as Giraffe, Pizza Express and Patisserie Valerie to name a few, we decided to hit the road (it's about a three and a half hour journey from Cheshire Oaks to our home) and eat in Wetherby which is about half way between the outlet and where we live. The happy face of someone who is about to eat...Ask Italian in Wetherby is a great little restaurant so thought it was worthy of a mention! So to the verdict? If you're looking for some real designer bargains and live near Cheshire Oaks, I'd definitely recommend it. If you love to shop, there's enough choice for you to easily spend a day there and plenty of places to eat or snack should you need a break. From our house, Cheshire Oaks is quite a journey, so I think in future we'll definitely stick to York Designer Outlet; it may have slightly less choice in terms of brands, but there's not enough extra at Cheshire Oaks to warrant the extra miles and time it takes to get there. I love McArthur Glen outlets though so I'd really recommend you check which one is nearest to you, there's always a good bargain to be found! I've been trying to convince Simon to take me to Cheshire Oaks every time we head to the North West for ages! I think I'm holding out for Bicester Village though, just a shame Oxford is SO far away! Maybe we need a bloggers trip to Oxford? !